I am on a high-speed train from Xuzhou to Beijing, which means that my 3-day trip to China is coming to an end. You might ask: “Is it worth the trouble to spend all this time on an airplane, only to be 12 time zones away from home for a few days?”. I would say these trips are always worth it, particularly when there is a chance to see old friends and learn new things. I want to talk about a lecture by Professor Laszlo Kurti of the UT Southwestern Medical Center in Dallas. Laszlo is familiar to many people thanks to some of the nice books he published together with E. J. Corey. I particularly enjoy their book on the named reactions and mechanisms thereof. Laszlo’s recent paper in Science described metal-catalyzed synthesis of NH aziridines, which are exciting synthetic targets. Despite my long-standing interest in this chemistry, I want to talk about another one of his lab’s contributions I enjoyed hearing about. Besides its synthetic value, there are compelling pedagogical reasons to think about this chemistry. From time to time I refer to the significance of mechanism and attention to experimentally determined reaction parameters that are germane to our craft. Take a look at the reaction sketched below. This is a remarkably efficient route to NOBIN-type ligands that was inspired by the Bertolli indole synthesis. This reaction, developed in the Kurti lab, teaches the significance of precision when it comes to measuring the amounts of arylmagnesium reagents. 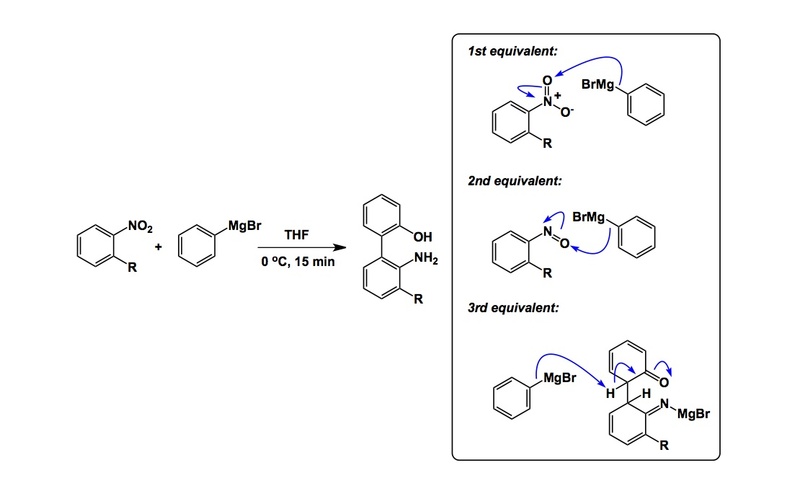 I encourage you to read about the exact mechanistic details using the link provided, but I am just going to say that failure to employ precisely 3 equivalents of the Grignard reagent leads to abysmal failure in this process. You might think that the use of 2 equivalents might simply lead to lower conversion, but it is more dramatic than that, according to Laszlo: failure to aromatize with the third equivalent leads to a mess. In other words, each equivalent of the organometallic species here is assigned its unique functional role. This also implies that the experimentalist running this process must titrate his/her Grignard reagent prior to use, which I am sure is not something that is done by some less careful practitioners of synthesis. All in all, attention to detail is what chemistry is all about. I tend to prohibit students who start doing research in the lab from running any experiments, no matter how trivial they might appear, prior to ensuring that the students demonstrate complete understanding of the mechanisms involved. Laszlo’s nice work is a testament to why this is important. Chemistry reminds me of the game of ‘Go’. Learn all the joseki and then forget it all….essentially mechanisms are to guide you but not let it lead you.